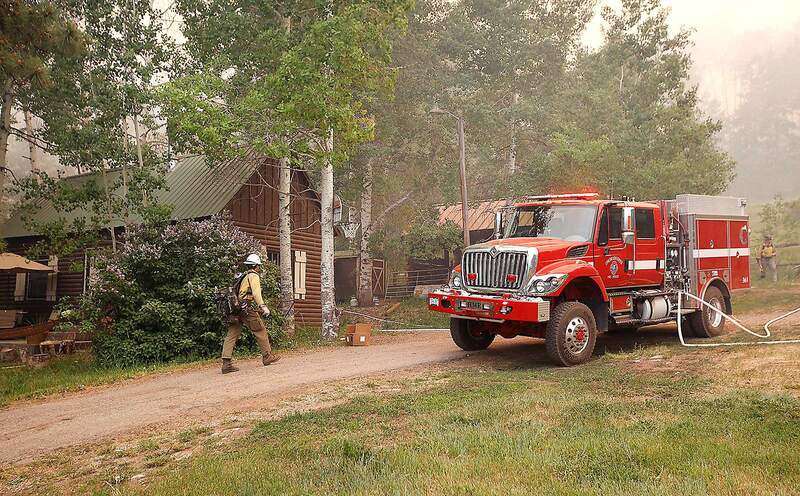 Firefighters patrol around a house Friday on the west side of U.S. Highway 550 a couple miles south of Needles Store. Firefighters are keeping an eye out for spot fires around structures as the 416 Fire approaches. U.S. Highway 550 closed about 4 p.m. Friday for active fire behavior north of Durango. 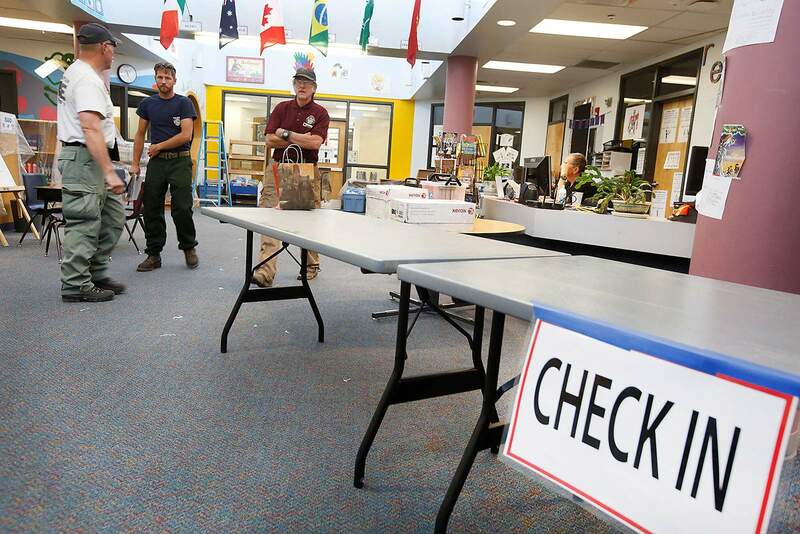 The incident command post for the 416 Fire is being moved to Animas Valley Elementary School, where the Type 1 Rocky Mountain Incident Black Team will take control of the fire. The campsite for firefighters will remain at Purgatory Resort. 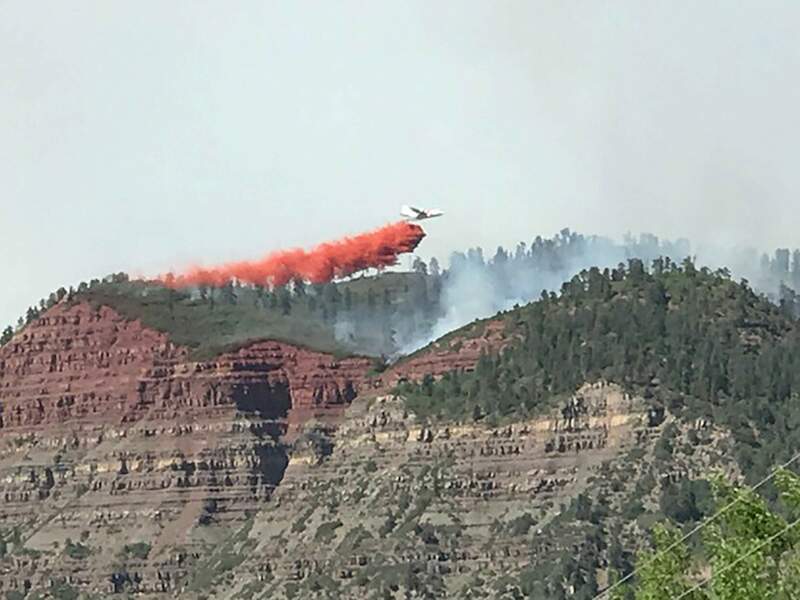 An air tanker drops slurry Thursday over the Hermosa Cliffs in front of the 416 Fire, which had grown to 7,180 acres as of Friday morning. 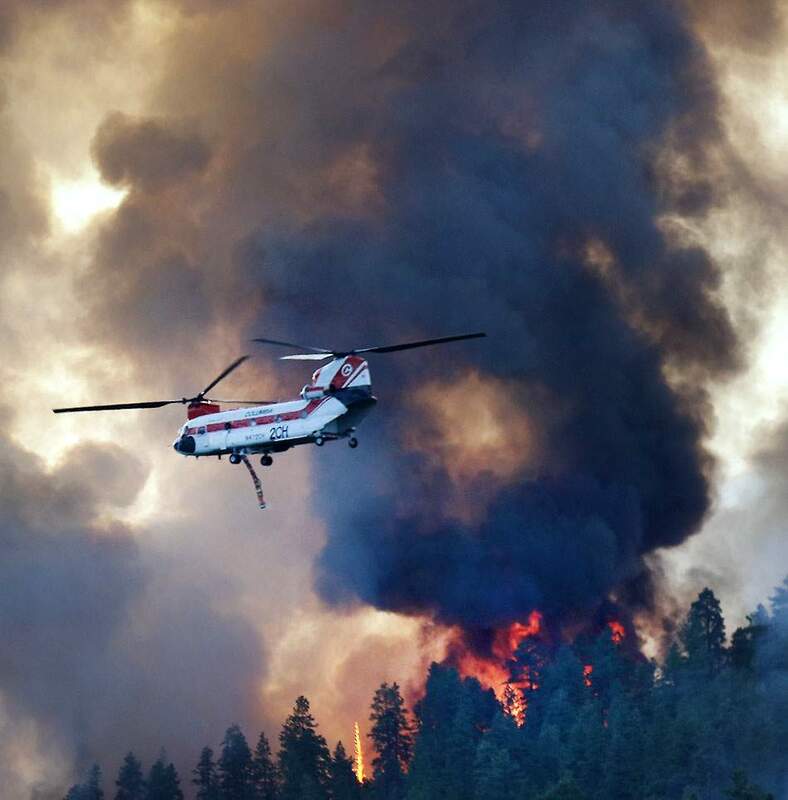 A Chinook helicopter prepares to drop a load of water on the 416 Fire Thursday evening near Hermosa. 6:34 p.m.The 416 Fire crossed Hermosa Creek, just west of the Hermosa Campground on the southwestern perimeter of the fire, said Neal Kephart, a spokesman for the Type II team. In other news, La Plata County and the Colorado Department of Local Affairs will establish a Disaster Assistance Center for citizens of La Plata County impacted by the 416 Fire, according to a county news release. The center will be open from 9 a.m. to 1 p.m. Monday and Tuesday at the La Plata County Fairgrounds Exhibit Hall. The center will have representatives from many local and regional resources to help connect community members who have been evacuated or whose employment has been affected by the fire with services and assistance. Organizations will include Community Foundation Serving Southwest Colorado, Region 9 Economic Development District, Durango Food Bank, Workforce Center, Durango Tourism Office, San Juan Basin Public Health, La Plata County Department of Human Services, Axis Health, Family Center, Manna Soup Kitchen, and the Red Cross. Additional Disaster Assistance Centers will be scheduled over the coming weeks, according to a county news release. 5:30 p.m.A new fire broke out in Montezuma County in the La Plata Mountains. Steve Orr, public information officer for the San Juan National Forest, said the fire, called the “Burro Fire,” was reported at 3:48 p.m. The fire was located on Forest Service land, about two miles southeast of the Bear Creek Trailhead between Dolores and Rico. The fire is at 5 acres, but Orr said it’s burning at a high rate of speed into the Bear Creek Drainage. A 20 person hand crew is on scene, and a crew of smoke jumpers were in the air as of 5:30 p.m., Orr said. Two fire engines are en route, as well as a helicopter. Another hand crew and additional helicopter have been called to the fire. Orr said the Burro Fire will not divert resources from the 416 Fire north of Durango. No structures are in immediate danger, and campers in the area are being notified of the fire. The cause of the fire is under investigation, Orr said. 5 p.m. A community meeting on the 416 Fire will be held at 6 p.m. Saturday in the La Plata County Fairgrounds Exhibit Hall. Doors will open at 5:30 p.m. It will be similar to the community meeting on Tuesday, said La Plata County spokeswoman Megan Graham. During that meeting, crews updated the community about firefighting efforts and expected fire activity. 4:40 p.m. Purgatory Resort suspended its summer activities and will not be open as planned on Saturday and Sunday as a result of the 416 Fire. The resort’s lodging remains open, and guests are staying at the resort, spokeswoman Kim Oyler said. The restaurant and market and deli also remain open, she said. The resort was open for summer activities from 10 a.m. to 4 p.m. Friday, she said. “We had a few guests who came up. I think they wanted some normalcy during this time,” she said. She could not say when summer activities at the resort would resume. Purgatory has been on pre-evacuation notice since June 1, and the resort is taking necessary precautions, she said. “Purgatory has been doing our due diligence to prepare,” she said. 4 p.m. U.S. Highway 550 is closed and it will not reopen Friday as a result of firefighting activity in the area. The highway may reopen at 8 a.m. Saturday with law enforcement escorts. The decision to reopen the highway will be based on fire behavior, according to a La Plata County news release. Fire activity or more evacuations could close the highway at any time Saturday, a Colorado Department of Transportation new release said. 2:25 p.m.The 416 fire is inching down the ridge on the east side of Hermosa, but no structures have been lost, Urban said. Structure protection crews are in the area prepared to defend homes and air tankers are dropping retardant Friday afternoon. Fire crews have done a lot of burning in preparation for the fire approaching the area. No spot fires have occurred, Urban said. Helicopters are dropping water on the west side of the fire to prevent the fire from crossing Hermosa Creek. The fire also continues to move north. Crews are building containment lines above Purgatory as a protective measure to make the area more defensible as needed. The area north of the fire has limited access and it is full of steep, dangerous terrain and lots of standing dead Douglas fir trees, she said. Crews are also scouting the north of the fire for additional natural fire breaks in the area, such as cliffs, she said. 1:11 p.m.The Type I team that is taking command of the 416 Fire will move its incident command post from Purgatory Resort to Animas Valley Elementary School. Some crews will continue to use Purgatory as a base camp. Several supplies will remain at Purgatory as well. 11:39 a.m.La Plata Electric Association said 650 of the 700 homes that lost power Thursday afternoon as a result of a burned power line have been restored with power. 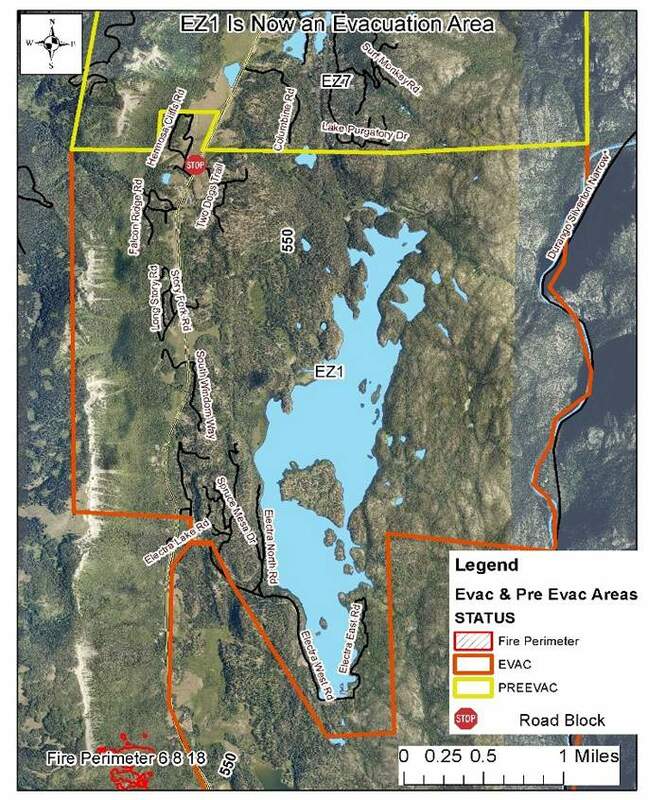 The 50 homes that remain without power are in the Haviland Lake area, an evacuation zone. A transmission line that runs parallel with U.S. Highway 550 in the north Animas Valley burned Thursday and remained de-energized Friday. As county evacuations move north, LPEA anticipates de-energizing distribution lines up the mountain at Purgatory Resort. But the base of Purgatory is expected to remain in power, although that could change based on conditions. LPEA’s system has not been damaged by the fire. De-energizing lines is a preventive measure to avoid additional fire hazard, according to the release. 10:30 a.m.An evacuation order was issued Friday morning for 304 homes on the east and west sides of U.S. Highway 550 from Electra Lake Drive north to Hermosa Cliffs Road and the north end of Two Dogs Trail subdivision. Law enforcement began notifying residents door-to-door at 10 a.m. Friday. Residents are told to evacuate the area by 4 p.m. Friday. The evacuations were issued in anticipation of the fire behavior and wind conditions expected Friday on the north end of the 416 Fire. Highway 550 southbound will remain open Friday until 6 p.m. to through traffic only with law enforcement pilot vehicles escorting convoys through the fire area. As of 11 a.m. Friday, a total of 1,625 homes were evacuated and 1,272 homes were on pre-evacuation notice. Additional evacuations were ordered Friday morning for 304 homes on the east and west sides of U.S. Highway 550 from Electra Lake Drive north to Hermosa Cliffs Road and the north end of Two Dogs Trail. Earlier todayThe 416 Fire grew by about 2,000 acres Thursday, its biggest growth spurt yet, bringing the 8-day-old fire to a total of 7,180 acres as of Friday morning. The fire grew mostly on the south and southwest side in the Hermosa area, where an additional 500 homes were evacuated and 750 homes were given pre-evacuation notices Thursday morning. Fire officials said the priority for Friday will be to protect structures in the Hermosa area. “We’re going to stay vigilant, and make sure there are no hot spots,” said Brian Eaby, a spokesman for the Type II team battling the blaze. 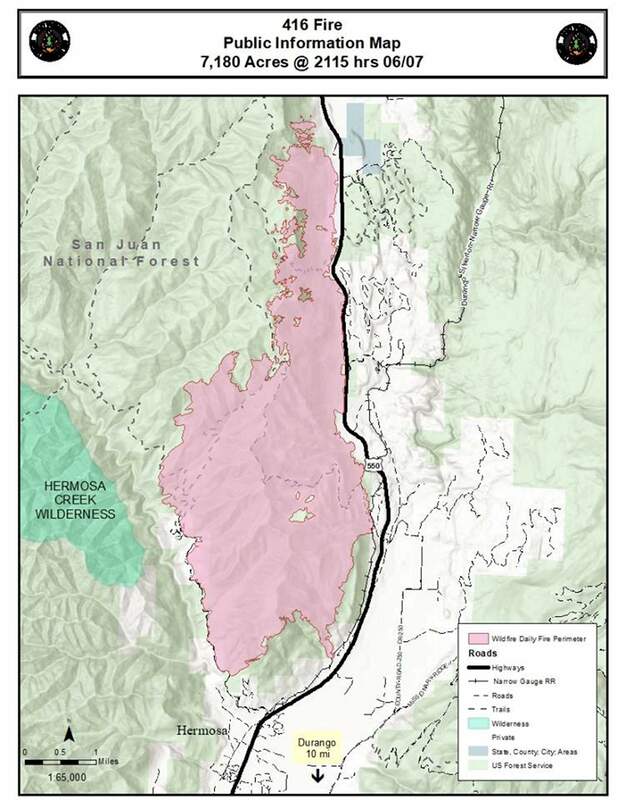 Torching and crown runs were reported as the fire crossed the Jones Creek Trail and the Hermosa Creek Trail, but not the Hermosa Creek drainage. Crews will continue to monitor and battle the blaze near County Road 201 to make sure the fire doesn’t get out of hand in the area. Hand crews spent Thursday constructing check lines to slow the fire, and worked with engines and air support to slow the fire from approaching structures. Crews underwent a successful burnout operation on the southwest side of the fire overnight that lasted until midnight, Eaby said. No structures had been lost as of Friday morning. “We do not anticipate at this time losing any structures,” Eaby said. Slurry was used in an attempt to slow the fire in an attempt to battle the blaze, after several days without it. “This tactic proved effective at delaying spread to lower areas,” Eaby said. Along with the fixed wing aircraft, four Type I helicopters, two Type II helicopters and two Type III helicopters will fight the fire from the air. The increase in acreage is a result of both self-imposed burnouts and natural fire growth, Eaby said. Aerial operations are creating a larger burnout area on the north side of the fire to serve as a barrier should the fire spread that direction from the southwest. Crews on the east side of the fire are looking for hot spots and are mopping up the area. “There was less activity on that side last night,” Eaby said. A Type I federal firefighting team will assume command of the fire Saturday at 6 a.m. It will spend Friday “shadowing” the Type II team. This consists of attending meetings, observing hand crews and transferring plans. “It’s a lot of giving them the information that they need to hit the ground running,” Eaby said. The winds won’t be as strong as Thursday, but it will be breezy. Gusts are expected to be between 15-20 mph at the fire, and Durango is expecting a high of 84 degrees, said Michael Charnick with the National Weather Service in Grand Junction. Fire potential is high today as a result of dry conditions mixed with low humidity, Eaby said.